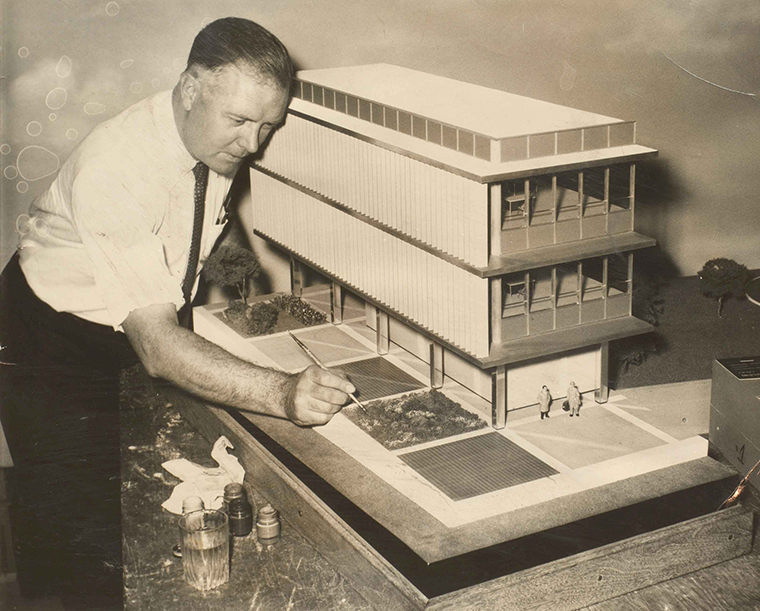 Theodore Conrad and a model of the Reynolds Metals Building in Richmond, Virginia. This book is a detailed historical account of the circumstances under which the postwar miniature boom in architectural model-making developed in the United States. Through an in-depth examination of the emergence of a diverse professional network, the development of new modeling materials, and the translations between different architectural media, it uncovers how the architectural model became a medium of equal standing for both the design and presentation of architectural projects. 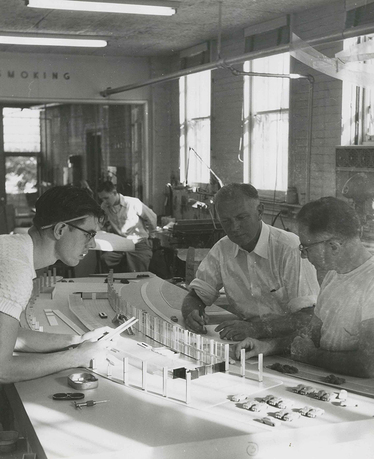 Excavating previously unknown models, model photos, and stories of the individuals involved, this study centers itself around the oeuvre of America's most important twentieth-century model maker, Theodore Conrad, and his extensive archive. Through case studies of projects, such as the Metropolitan Life Building, Rockefeller Center, and Lever House, The Miniature Boom ultimately presents an alternative history of architecture, by highlighting the impact that architectural models and their makers had on the structures that were made with their help. Teresa Fankhänel is a writer, exhibition maker, and researcher. In June 2016, she successfully completed her PhD dissertation, The Miniature Boom. A History of American Architectural Models in the Twentieth Century, at the University of Zurich. Previously, she worked as the curatorial assistant for the landmark exhibition The Architectural Model: Tool, Fetish, Small Utopia (DAM German Architecture Museum, 2012). 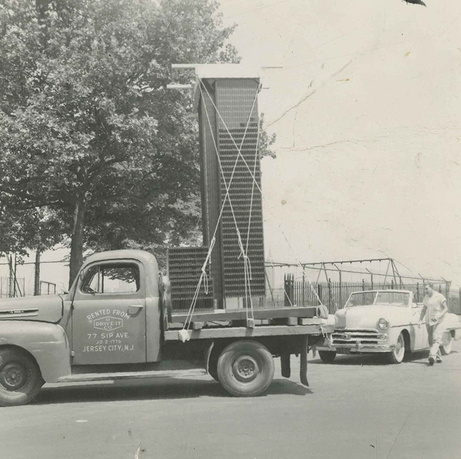 She has been an instrumental leader in the preservation of Theodore Conrad's architectural models and archival materials, which were recently given to the Avery Architectural and Fine Arts Library and the Museum of Modern Art. Fankhänel currently works as an art critic in New York and Berlin.